Got a date? Cold-weather style presents its own set of challenges, whether you're bundling up to head outdoors, or cozying up to binge-watch your favorite series. The perfect outfit needs to be warm, comfortable, and stylish. The good news? With warm outer layers, cushy knits, and a few luxe metallic touches, you'll be ready for your romantic evening. Browse some of our favorite looks (and date ideas) and get inspired to go out. Capture the excitement of the theater in a stage-worthy outfit. A velvet jumpsuit that sits off the shoulder is an elegant base to start. 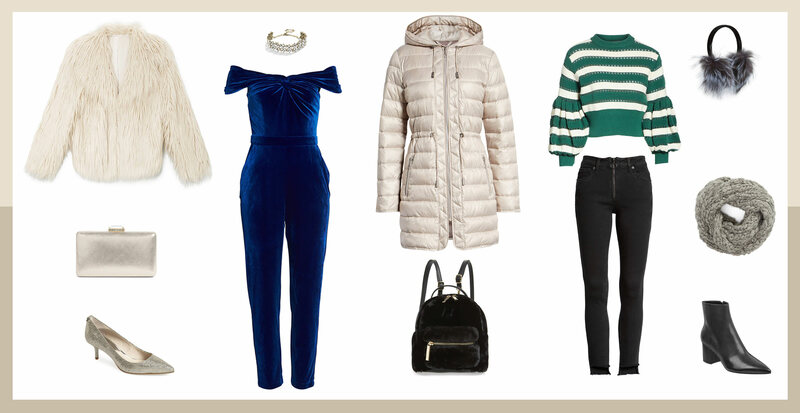 From there, add a dreamy faux-fur jacket for a bit of drama. Top this look off with some shimmer and shine in the form of a crystal choker and a silver kitten heel. The show will be magical… and you’ll look equally stunning. Ahh! It’s finally happening, and you’re going to need a strategic look. Wear something that’s both sophisticated and warm when it’s time to meet the family. A classic long wool coat in a great color sets the tone. Underneath, a floral wrap-dress with long sleeves adds romance and lots of coverage. A low-heeled mule is classy and demure, so finish off the look with eye-catching earrings. Outdoor activities in the winter are enchanting—but extra chilly! Whether you’re lacing up skates or watching a tree lighting, go for maximum warmth. A hooded puffer coat in a light and bright color is cute and casual. Layer it over a fun sweater with volume sleeves and stretch-denim skinnys that let you move around freely. Stay toasty with accessories like a chunky knit scarf and furry earmuffs. When the weather outside is frightful, sometimes it’s best to stay inside and cuddle up—but that doesn’t mean you can’t get comfy in style. An off-shoulder sweater adds a flirty vibe, and can be dressed down with a pair of on-trend joggers. If you need to leave the confines of the couch, throw on a plush teddy jacket and neutral kicks to complement your cozy look.